← 2 Crafty Ways To Wrap Gifts! We couldn’t help but fall in love with these three adorable recipes. They are so creative and tasty, we think they should definitely be in the running to dominate the menu for your next party! The first recipe is for pinata cookies from She Knows. These are a little labor intensive to make, but the results are amazing and super fun! Pinata Cookies – Click here for recipe! This next recipe from the blog Six in the Suburbs is a little simpler to prepare, but just as adorable as the pinata cookies. Caterpillar Grape Kabobs – Click here for recipe! Not everybody is a fan of deviled eggs, but it’s hard to pass up these cute chicks from Squidoo! They would be great for a farm themed party! Chicks Deviled Eggs – Click here for recipe! Which recipe do you think wins the tasty and adorable award? 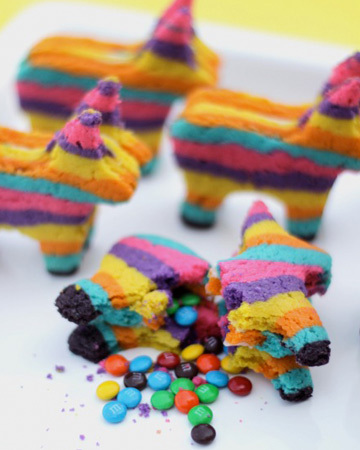 The pinata cookies are super-cute, but whack! to be destroyed in just one bite is sad. It is a little sad, but for a special occasion worth the effort! Too cute! I bookmarked these, thanks!